It has recently been revealed by the official sources of Suzuki that the company plans to replace its iconic Mehran 800 cc with Alto 660 cc. The company officials shared this information with the Senate Standing Committee on Industries and Production while it was paying a visit to plant of Pak Suzuki Motor Company Limited. The Standing Committee members urged the manufacturer to equip the vehicle with the security features of global standard. 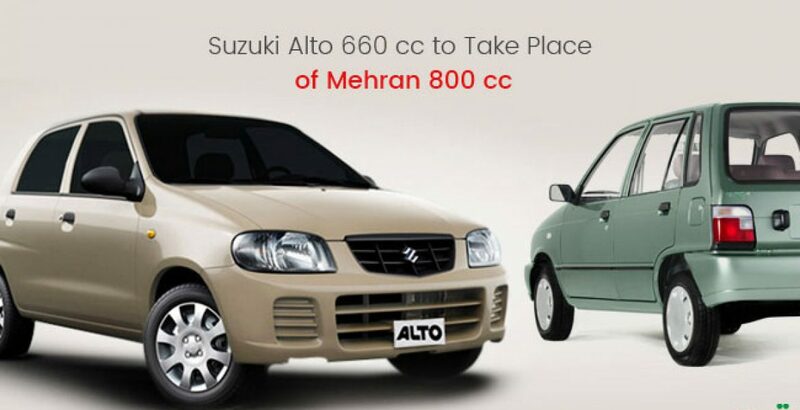 Mehran, a more powerful and younger sibling of Alto, has been in automobiles market for nearly three decades. It is considered one of the most economical cars. The Suzuki Mehran price in Pakistan for a brand new model is around six and a half lac rupees. Here is something surprising. Despite the fact that Alto is considerably less powerful, the Suzuki Alto price in Pakistan is relatively higher, more than seven lac rupees. This is particularly because of the graceful design, bold look and better fuel economy. Suzuki’s Alto 660 cc is one the celebrated small cars from the Japanese Suzuki Motor Corporation. Famous as a city car in different countries of the world, Alto has successfully survived in the market for nearly four decades after its introduction in 1979. Another name for this vehicle is Mazda Carol. The body styling is like that of a 5-door hatchback. It is available in the front-wheel-drive and four-wheel-drive versions. In comparison with Mehran from the same manufacturer, Suzuki Alto is somewhat less powerful. The former carries an 800 cc engine while the latter’s engine displacement does not exceed 660 cc. However, the fine and creative body dimensions make Alto look so bold and graceful. Its looks are more attractive than that of Mehran. The buyers will also be pleased with the incredible fuel economy. Another important plan of the Japanese automobile manufacturer is to replace Cultus with Celerio. The 1000 cc Suzuki Cultus came as a replacement for Suzuki Khyber in the year 2000. Now this supermini car is going to be replaced with Celerio which also brings the same engine power, i.e. 1000 cc. It is expected to be introduced by March 2017. Here it is also pertinent to note that Mehran was introduced in the year 1988 as an alternative for FX 800 cc. In the same year, Pak Suzuki discontinued the sales of Suzuki FX after several years of its initial introduction in the auto market. Mehran has been enjoying high demand in the market for nearly three decades since the time of its induction into the market. Even the influx of various brands of used imported cars could not create significant turbulence in the sales trends of the vehicle. Alto is already one of the big names in the auto industry of the country. There are many factors that promise a bright future for this smart and sophisticated city car. Being low priced, it is easily affordable for the low income buyers. The fuel economy is yet another great thing that goes into very favor of the vehicle. On the third place, the attractive and innovative body styling makes Alto look like a modern luxury car.